The Spectra Cell is a ruggedly constructed, heavy duty, high efficiency filter. A special dual layer, graded density media ensures extremely high dust holding capacity & therefore lower operating pressure loss. 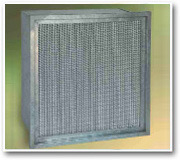 The high efficiency and moisture resistance of the filter keeps the inside clean & protects against moisture and salt. Filtrair's Optipleat serve as highly efficient final filters in air intake systems of combustion engines. Filtrair's 'Optipleat' filters represent the latest advancement in pleated filter technology. Due to its optimized, wide-open and patented fixed pleating structure, the Optipleat pack sports a unique V-supported deep pleat with an unmatched 10 mm wide air entry pleat throat. This results in an excellent combination of pressure drop and dust holding capacity. The Optipleat Filter uses a Unique blended glasssynthetic fibre filter media. 'Spectra Cell Compact' mini pleated filters offer substantial advantages over conventional deep pleat ASHRAE filters, not the least of which are higher flow capacities, less space, reduced resistance to flow, and greatly enhanced dust holding capacities. It serves as an excellent final filter for in air intake systems of combustion engines and as a final filter in HVAC systems. Spectrum high-temperature filters are used for air filtration applications involving temperatures > 100°C (>212°F) up to 400°C (752°F). The silicone-free filter media are made of special, temperature-resistant glass fibre paper with high mechanical stability and moisture resistance. The pleat distance is maintained by aluminum separators with rounded edges to avoid damage to the pleat pack during transport, mounting and operation. Protection grids on both upstream and downstream side also prevent damage to the filter medium. The protection grids and the filter frame consist of galvanized steel, so as to reduce the risk of particle shedding caused by the constantly high temperatures. Spectrum high-temperature filters are equipped with a temperature-resistant gasket to preclude leaks. The Spectra Cell V bank filter features a fire retardant, water resistant glass fiber media housed in a sturdy polystyrene frame. The pleats are separated with thermoplastic (hotmelt) separators. A very high ratio of media to filter face area ensures that the filter is capable to handle very high air flow volume at relatively low pressure drop.